I have posted various parts of Barb Fenick's Beatles story from 1969 over the years. I have located the last part in the July 1974 issue of The Write Thing. 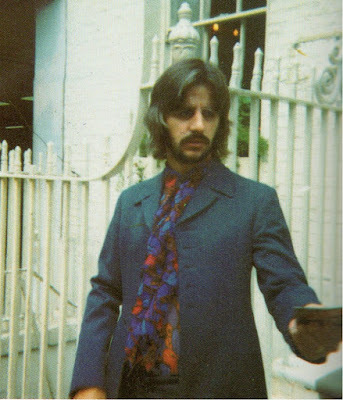 Monday, August 11th (1969) was our last day in London and Jeri, Sara and I resolved to try to help Paul get his stolen property back if we could. Every time we'd ask someone in the know why Paul was so distant and unrelaxed with his fans this summer, they'd always say it was the robbery and now he didn't trust any of his fans. So we concluded that if he knew who had done it and if he could get back at least most of his stuff then he wouldn't have to take it out on the rest of us. Although we knew that it was more than just the robbery that had Paul so withdrawn, still our intentions seemed logical and we really wanted to help. 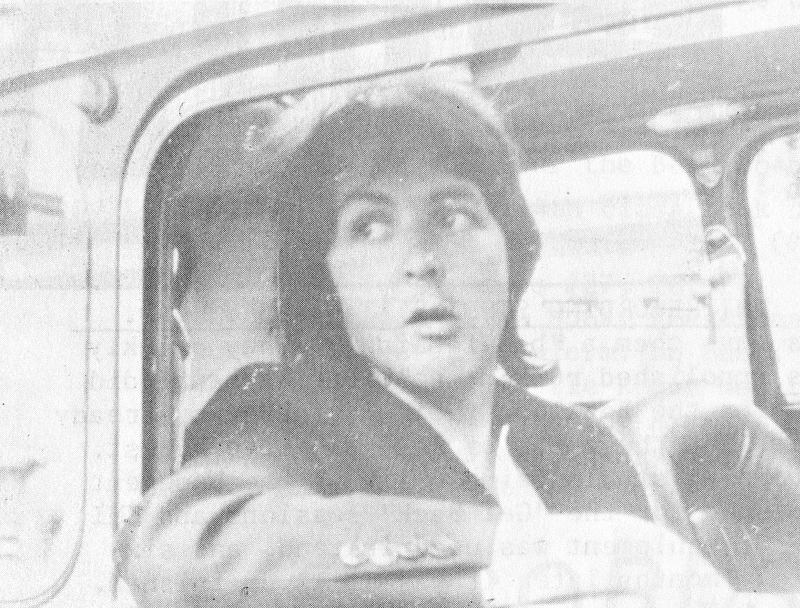 We knew that one guy was selling prints made from the thousands of slides stolen from the McCartney's collections (he was charging $1.20 - half a pound a piece too) and that he knew who the actual thieves were (although we had a very good idea ourselves). We started out by taking the matter to Apple; the people there got all shook up and called Mal at EMI and told him to expect us. I turned around to see Rich and Mo coming in and said hello to both of them. They smiled in recognition and Mo said hello back. Ringo's chauffer, Allen, said he'd drive us over to EMI if we could wait until he was through there. But we thought our matter was so urgent that we had to hurry right over to EMI, probably afraid they'd change their minds about letting us inside (they never let fans in), so we turned down his offer and I've always regretted it. That twice I missed the chance to pull up to EMI in Rich's white Mercedes! Before I got on the subway I called Richie back at the hotel and told her to hurry down to Apple as fast as possible before Ringo left. she made it too, breaking all speed records as she dashed out of the hotel, hair still wet, and told the cabbie to "step on it." She got the most beautiful picture of rich for her efforts and had the chance to say goodbye to him, promising him she'd come back next year. Finally, we talked the matter over, with Mal who pocketed the eight pictures Sara had bought from that kid, promising to show them to Paul and give them back to her (he told us later he gave them to Paul). He promised to get on that kid and get the matter solved. But he had always been buddy buddy with the kid and we realized later than nothing was really goingn to change, all our efforts and concern had been for nothing. We were all such suckers. The only thing that changed was us. We learned a lot of things that summer. We were never the same again. At EMI, 3 Abbey Road the Beatles were putting the finishing touches on the last album they were to make together. The day John came to EMI after his terrible car accident in July, with stitches on his forehead. Paul ran out onto the steps and hugged him. And the last track on the last side was "and in the End." That's what I mean about yesterday's Apple Scruffs being today's historians. If a music critic were writing a book about making ABBEY ROAD album, "The day John came to EMI after his terrible car accident in July, with stitches on his forehead. Paul ran out onto the steps and hugged him" would be the kind of little observational detail in a mosaic that would make the writing recreate the moments, instead of just dry dates and facts. And it's the bystander fans who provide that eyewitness detail by what they remember. They might think this or that memory of a few seconds in a day 50 years ago is so fleeting it's trivial to anyone else, but when those little details are pooled together, they make a little bit of history come alive. Music historians should clock that more, and when they research this and that musicological Beatles tome, should ask as many 1st generation Beatle fans as they can for even their slightest remembrances - - because when you piece them all together, then your jive will swing. to give a lift to anyone other than J.G.P.& R,and their wives,maybe Apple staff. I find it kind of weird how every time Barb mentions George it's something negative. He had a temper sure, but by most accounts he was the most patient with fans, including during this time. Idk, I find it hard to believe every interaction she had with him involved him raving like a lunatic.